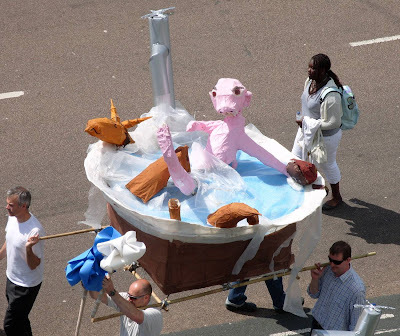 It looks like a cross between Gollum and a pig with swine flu enjoying a bath with a snake. And the worrying thing is that you know the people carrying it are qualified teachers. 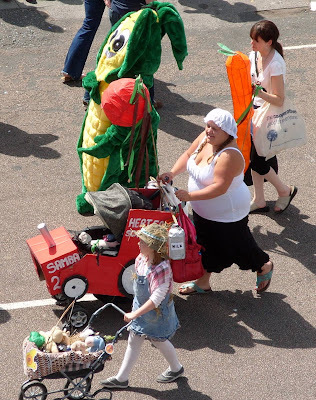 Anyhoo, last year Lisa and I missed the Children's Parade because we were buying maternity clothes in Hove. This year Lisa missed it because she'd had a sleepless night with a baby. No one could have seen that one coming. But the good news is that while Lisa went back to bed for a couple of hours, Amelie and I headed down to the seafront to watch this year's event. I wanted to pick up a few tips for when we're taking part ourselves. 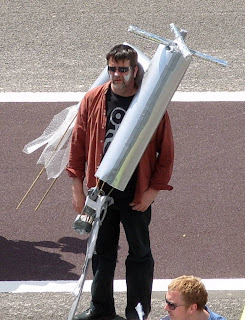 I think the main thing I learnt is that if you agree to let your daughter take a giant tap made of cardboard, you can bet your life you'll end up carrying the thing. To be honest, that bloke wasn't the only tap dancing along the seafront this morning. The theme of this year's parade was 'The Elements', so we had a lot of earthworms, windmills and fireflies, plus a few people with hosepipe banners. But for me, the most entertaining chap there was Pat Power, "percussionist, educator and composer - and simply one of the most respected innovators on the UK samba scene", at least if you believe this website. He stood on a stepladder in the middle of the road, wearing a white suit and waving his arms about, while the Barulho samba band (none of whom were children, or dressed as taps) proved that there's more to South America than pork-related viruses. He's either signing for the deaf, or doing tic-tac for Ladbrokes.